Vladimir Mouraviev, MD, PhD, will soon become the section editor of Grand Rounds in Urology’s soon-to-be released Next Generation Learning Center in Microbials. The European Association of Urology (EAU) will honor Dr. Muraviev this weekend during their annual meeting. The EAU has accepted two of his posters to present during their Expert-Guided Poster Tour session. 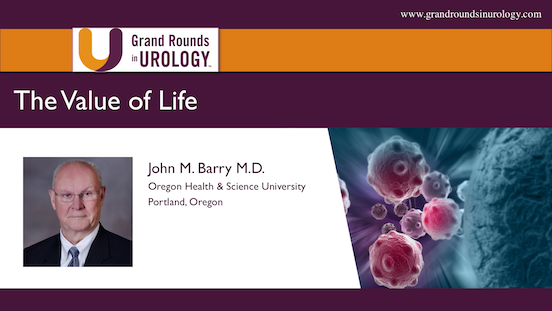 John M. Barry, MD, Professor of Urology at Oregon Health & Science University, shares the insights from his life and tenure as a urologic surgeon that he has found most helpful and valuable. He gives his perspective on values, impactful books, principles, character, parenting, careers, time, decisions, change, and death in this presentation. 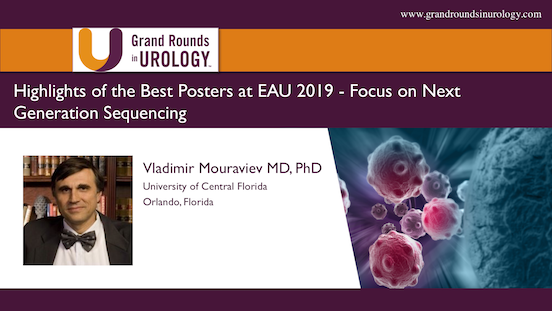 Vladimir Mouraviev, MD, PhD, discusses the history and recent advances of testing for urinary tract infections (UTIs) and advocates for using the next generation sequencing option to identify biofilm-driven chronic infections in the modern era. Kevin T. McVary, MD, illustrates that while nocturia is the leading lower urinary tract symptom (LUTS) complaint that prompts men to seek out urological care, the condition persists without improvement in 50% of patients, even after treatment. Therefore, there is a significant unmet need in nocturia management practices. He discusses the condition’s financial and quality of life (QOL) burdens, its multifactorial etiology, and his perspective on treatment approaches. Fred Bartlit, a renowned trial lawyer with 60 years of experience, explains the science behind exercising to combat sarcopenia. During this discussion with E. David Crawford, MD, he summarizes the main points of his book Choosing the StrongPath: Reversing the Downward Spiral of Aging. E. David Crawford, MD, argues for using PSA levels of 1.5 ng/mL as the cutoff for routine screening in primary care. He emphasizes the importance of informed decision making in the event of abnormal results, reducing unnecessary biopsies and overdiagnosis, and relying more on genomic markers for detecting significant cancers. Ronald F. Tutrone, Jr., MD, FACS, summarizes two Phase III clinical trials testing the safety and efficacy of fexapotide, a novel treatment for benign prostatic hyperplasia (BPH). Martin E. Gleave, MD, FRCSC, FACS, discusses his views on improving advanced prostate cancer treatment approaches. Specifically, he emphasizes methods that integrate various treatment options beyond surgical castration and androgen deprivation therapy (ADT). Lawrence I. Karsh, MD, FACS, discusses the use of SpaceOAR Hydrogel to reduce risk of rectal complications and improve quality of life (QOL) outcomes when treating prostate cancer with radiation therapy. He summarizes supporting clinical evidence, describes the physical application of the gel, and lists players currently offering coverage for the procedure. Eric J. Small, MD, defines nonmetastatic castration-resistant prostate cancer, or M0 disease. He then discusses the design, implementation, and results of the SPARTAN trial, which he presented at the 2018 Genitourinary Cancers Symposium. The study tested the efficacy of apalutamide in men with M0 disease. Matthew E. Nielsen, MD, MS, discusses the challenge asymptomatic microscopic hematuria (AMH) poses in our urologic practices. He summarizes the evolution of guidelines for evaluating hematuria and trade-offs in benefit, harm, and cost of different diagnostic approaches.